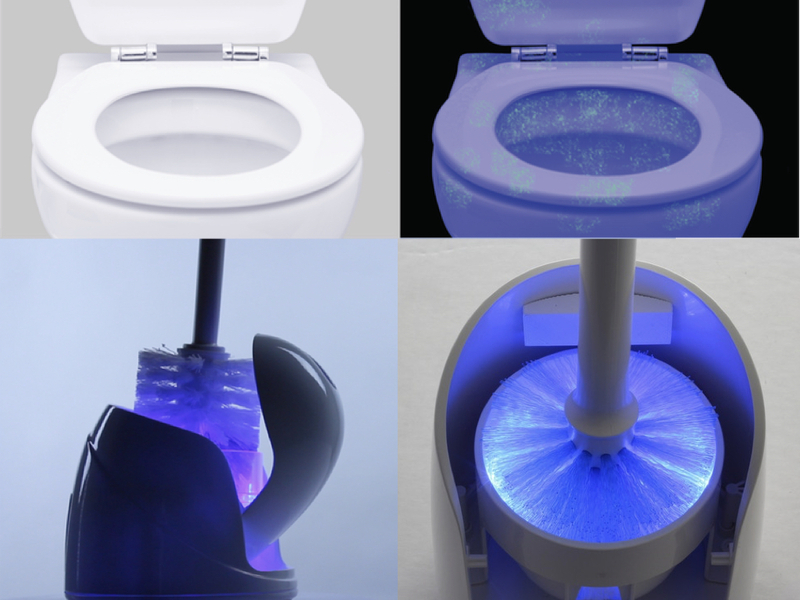 The LUMI toilet brush and base is a system that uses UV lights in the base to kill germs on the toilet brush. The light is automatic and kicks on when the brush is inserted into the base. It kicks off after an 8-minute sanitizing cycle is finished. The lights are powered by 3 AA batteries in the base. It also features a no-tip base and replaceable brush heads. The early bird kit includes the brush, the base and one replacement head for $40, or you can buy the brush and the base for $45 after the early bird special is sold out. Review and Discussion — Is it worth the money to back it? The very first thing you need to know is that the company is not really releasing what stage of production they’re in, other than to say that the product is now in its development stages, having received enough money to begin work on it. So, as of now, there really aren’t fulfillment dates on the campaign page. There are a lot of aspects of the product that are undecided right now because of this. Unlike the cheaper popular toilet brush like this one, the only thing we really know is that international shipping cost is going to be incredibly expensive. It costs $30, which is nearly as much as a single kit itself. They site size and weight to be the reason for the steep international shipping costs. So, it’s very likely that even domestic shipping will be steep. One drawback is that you really only get replacement heads with the 1 and 2-packs. There are 3 and 9-packs, and even a 50-pack for distributors. So, imagine being a distributor with 50 of these systems, and no replacement heads. Or, if you have a large household and buy the 9-pack only to find there are no replacement heads. It would be incredibly annoying. They’ve recently stated that they plan on selling the heads as add-ons, but it would have been more convenient to buy them all at once, as you can with the 1 and 2-packs. There are a lot of fantastic claims about how long components of this system actually last. They say that 3 AA batteries will last for somewhere around a year if you clean twice a week, and around 2 years if you clean once a week. However, I’ve never known an AA battery to last for two years, and they may well go bad by then. There’s also not any sort of battery indicator on the system, so it will simply stop working when they run out. UV lights are already used in lots of household products and have a wide array of applications. So, we know that they will break down and need replacing after a while. When asked about whether they would sell replacement lights, they said you wouldn’t need to ever replace them. The claim they make is that the light will last for 1,000 years. A lot of their backers have been very confused by the pictures featured on the campaign page, which appear to show a black color option. The company says that they never pictured a black kit and claim it’s a trick of the lighting. They also say that they never noticed that it looked black in the pictures, which is a pretty huge oversight. I’ve never heard of someone posting pictures on their campaign and not looking at them both before and after they posted it. But, I’ll give them the benefit of a doubt. However, so many backers are fervently requesting a black option that it seems insane for the company to reply that they’re not considering it, but they’ll let backers know if they do. Probably the most glaring drawback is that in previous campaigns by the company for different products, like a soap dispenser and a light-up toilet bowl, were scandalously disappointing. Backers complained that the products were poorly made or didn’t work right. And, to make matters worse, the company wouldn’t respond to backers after the campaigns ended. It left such a bitter taste in their mouths that some have opted to back the toilet brush simply to comment and warn other backers. This campaign has a lot of drawbacks and discrepancies. Not only that, there is a lot of important things that the company just isn’t sure about, like when the products will be fulfilled. It’s a really cool idea, and it could be a great product with some more development. But, as it stands, I would personally wait until they get further along and maybe even until after the products have been fulfilled to see what the backers say about the product. This project is now funding on Kickstarter until Fri, October 12 2018.